Currently, this XL size marker (9" x 6") is the only style we offer in our Marker Starter Kit. Your set of 5 markers are offered in the flush mount style flat with the ground (shown above), or in this upright style. If you are interested in placing an order for a Starter Kit, please download an order form HERE to mail with payment, or you can purchase online safely and securely with PayPal (below). Kits include five (5) XL markers, with rods/stakes, labels, label templates on computer CD and label applicator. Price includes free shipping. A LASER printer is required to print the labels in this kit. This kit is ONLY available to funeral homes and cemeteries in the USA. Offer available to new customers only. 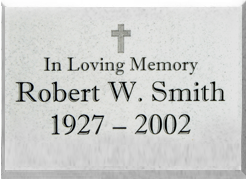 Our grave markers are proudly made in the U.S.A. They are made from high impact polymers and galvanized steel rods. 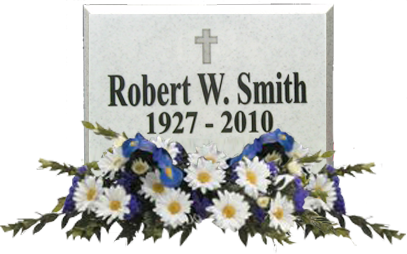 Our grave markers are built to last and easy to use. Please feel free to contact us via email at drini@beamerproducts.com with any questions you may have regarding our products.